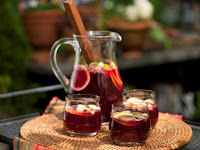 We're off on a much-needed staycation at a local spanish/southwestern inspired resort so I thought I'd share a classic spanish sangria with you today. ¡Salud! Have the fruit, rum, wine, and orange juice well chilled. Slice the lemon, lime and orange into thin rounds and place in a large glass pitcher. Pour in the rum and sugar. Chill in refrigerator for 2 hours to develop the flavors. When ready to serve, crush the fruit lightly with a wooden spoon and stir in the wine and orange juice. Adjust sweetness to taste.